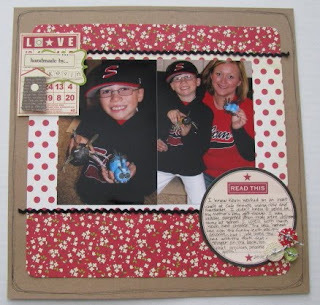 Memories by AmyInKy: Scraplifting + Noel Mignon = FUN! I mentioned yesterday that my scrap time is limited right now. (We are staying busy!) I'm finding that scraplifting is a way to make the most of my scrap time. 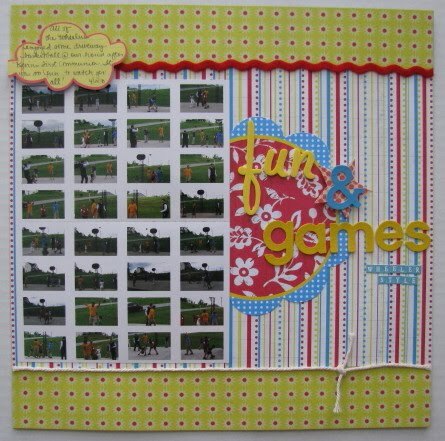 I'm also finding that my Noel Mignon "Playdate" kit is a never-ending supply of scrappy goodness! 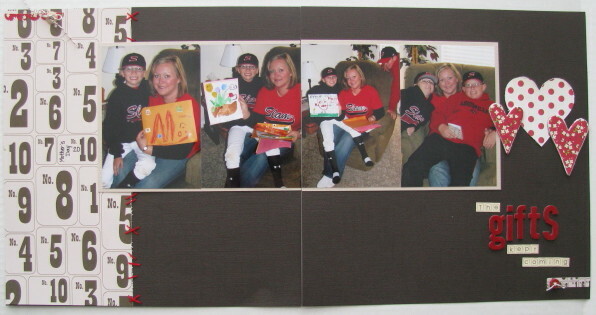 I scraplifted a good friend, Melanie, for this layout about Mother's Day. I'm such a fan of her work. 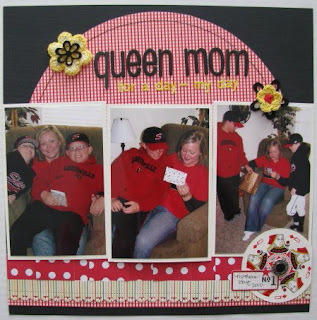 I loved the round Queen playing card that was in the Playdate kit. It inspired my title. I also have a "companion" page to go along with this layout, but I can't post it just yet. "Love Handmade by Kevin" started out as a lift of a layout in the June Scrapbook Trends, but I ended up going in a different direction. In addition to items in the Playdate kit, I also pulled out some other Jillibean Soup embellishments (and bird house cut from paper) and black rick rack. Aren't these the cutest handmade gifts? I love my bee (with fork handle wings and fork feet - but the "stinger" on the back is the best!) and especially my blue "mohawk" bug. The teeth on that thing crack me up. Kevin made these at Cub Scouts. The grandmother of one of the boys is the art teacher at a local middle school. She fired the creations before they were delivered to me at work. They were quite the surprise for Mother's Day! 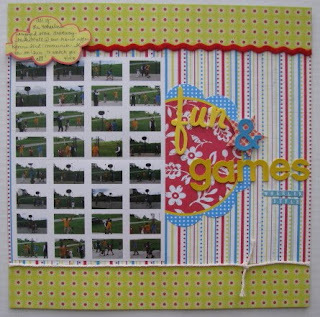 Cheryl Nelson had a layout in the June Scrapbook Trends that I lifted for this layout, "fun & games." Instead of using several individual shots like Cheryl did in her original, I used two 4x6 collage prints with 16 photos each. The shots are of my guys in the driveway playing basketball with Uncle Terry and his three kids. It was a fun afternoon! I just had to add some alphas and the red rick rack to the Playdate kit. Finally, there was a single page, one photo layout in Scrapbook Trends that I really liked, but I rarely do one photo layouts. Instead, I took Gretchen McElveen's idea of handstitching down a border and addition of three hearts and stretched it into a 2-pager with 4 photos. The patterned papers with red and the red alphabet was in the Playdate kit. Everything else was pulled from my stash. On Mother's Day, my gifts really did keep coming! Kevin gave me a whole envelope full of goodies!